A website conversion takes place when a visitor to a website takes the action the website owner wants them to take. This action could be anything from starting a real time chat or downloading a valuable piece of content to submitting an RFQ (request for quote), making a donation or completing the buying process through ecommerce. 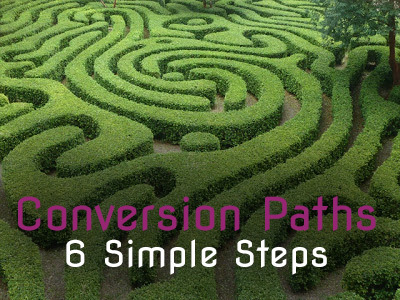 To make your website a lead generating machine, you need to understand the path to a small business website conversion. If you want to generate quality leads, you need quality website traffic. Yes, quantity can be important, but the quality is even more important. We tell our clients that it would be better to have 1000 quality visitors that are actually interested in their offering than have 2000 visitors that have little to no interest in their offering. Through small business SEO, search engine pay-per-click advertising and/or social media paid advertising, you can really hone in on your ideal buyers and generate quality traffic for your small business website. If you want to generate leads, you need to have something of value to your ideal buyer that you can offer for free, in exchange for some basic contact details. This valuable resource could be a free sample of your product or service, but most often it is content of some sort. We have tons of resources on this blog about content marketing that can help. The key to creating effective content for your ideal buyer is speaking to THEIR needs, NOT your products or services. If your content is all about how great you and your offering are, it's only serving your ego. It's not going to attract leads. Valuable content addresses and helps solve problems that your ideal buyer has. It makes your ideal buyer's life easier. It helps them correctly learn about solving their problems, through your offering, without selling directly. If the content isn't valuable to your ideal buyer, they won't convert. It's also important to consider context when you are writing content. You will likely have a higher percentage of early stage buyers to your website, than buyers ready to pull the trigger. This means you need a lot of valuable content for visitors in this stage. You also should have content for buyers that are further down the funnel and more qualified. To capture a lead, you need a landing page. A landing page is a page on your website that's sole purpose is to collect contact information from a website visitor in exchange for the valuable resource you're offering. There are many best practices for your landing pages, and we've covered landing pages extensively on our blog. The idea here is that we want to have an actionable message that relates to the valuable resource you're offering, while eliminating any distracting content (e.g., navigation, other call-outs, etc..) and making it very easy for a prospect to complete the form to get the goods. If you want your form to convert at a high level, you have to be willing to get by on less data. Ask for their name and email to start. Later, test with more data points like their biggest challenge or company size. The less you ask for, the more likely they are to provide any contact information at all. You have to get your website visitors to the landing page somehow. The call to action is how you do it. A call to action is a design element or button that prominently engages the website visitor to pursue your valuable resource from Step 2 above. It's like an advertisement on another page of your website that's sole purpose is to get the visitor to click through to the landing page. Calls to action (CTA) should have actionable text that entices the visitor to click. CTAs should contrast from your site's design as much as possible to draw the eye to them. The text with the CTA should be benefit-focused and intriguing to your ideal buyer. The thank you page is where you provide a link to the valuable resource, if it's content, or confirm that you will be sending them a sample, etc... This page is too often a rushed step. You need to look at the Thank You page as a way to "up sell" additional resources that may be helpful to this website visitor. You may want to use a landing page for the other offers that asks a bit more about the visitor to add to your records. The thank you page is also a great way to generate social recommendations. Be sure to allow the visitor to share the landing page to the valuable resource through Facebook, Twitter, LinkedIN, Google+, etc... and definitely allow them to email it to a friend or colleague. Now that you have a new lead, you have to follow up with them. DO NOT CALL THEM OR EMAIL THEM DIRECTLY SOLICITING BUSINESS. I hope I made myself clear. When the visitor downloads 1 resource, they are not a qualified lead, unless they've asked to be contacted in your landing page form. Don't harass them...yet. Nurture them a bit with valuable follow up techniques. For example, you now have their email address. You should probably make sure they are included in your email marketing campaigns. You may want to let a day pass and send them a related content resource to the one that they already downloaded. The idea here is to move them closer to being a qualified lead, not ask them what it will take to get them in your product today. The process to start creating conversions online for your small business is not overly complicated, especially if you have properly planned it out. The important thing is to make sure you've clearly laid out the conversion paths on your site so that your website starts working for you.